Callisto will attend the 6th TSS, the international gathering for space stakeholders between 26-28th June, booth B19, at Centre de Congrès Pierre Baudis in Toulouse. Callisto is participing in Toulouse Space Show, a major global forum dedicated to innovative Space solutions, highlighting future trends & the new Space economy. Frédéric Allétru, Sales Manager, with other staff members will look forward to meeting you at the booth B19, in the Aerospace Valley-New Space Factory area. Some Callisto’s equipment will be on display. 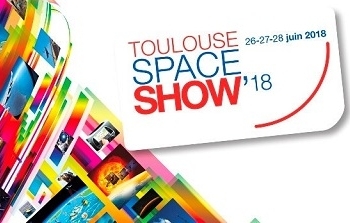 Take advantage of our innovations and join us in the Toulouse Space Show at Centre de congrès Pierre Baudis - 11 esplanade Compans Caffarelli – 31000 Toulouse – France on June 26～28 2018.